Last October, just before the provincial government relaxed regulations to allow for many more hogs to be produced in this province, George Matheson, Chair of the industry group, “Manitoba Pork,” testified before a legislative committee. In an astonishing display of corporate hype, Matheson seemed to think he could, with a single statement, obliterate years of solid scientific research, conducted in his own province. Dr. Eva Pip taught biology at the U of W for more than 50 years before retiring in 2016. 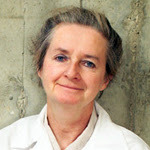 She has published almost 100 peer-reviewed articles in her career. More than 800 scientists in serious academic circles around the world have cited her work, as a building block for their own. Many big livestock operations, including hog “mega-barns,” have been operating in southern Manitoba for years. This doesn’t make sense to Dr. Pip. “Our provincial government was irresponsibly allowing barns where periodic flooding was very likely, even certain. Since floodwaters flow into Lake Winnipeg, and also to Lake Manitoba via the Portage Diversion, this means that waste affects a very large area, not just the immediately adjacent waters.” Epic flooding in the Red River Valley in 1997 washed a host of human-related contaminants into those lakes, including waste from hog lagoons. But, could human health be at risk here, too? Further research by Dr. Pip less than four years ago, shows that indeed, it could be. It found a dangerous neurotoxin called BMAA at three places near the shore of Lake Winnipeg’s south basin. Levels of it were found to increase significantly after heavy “blooms” of the blue-green algae and when solids were suspended in the water. BMAA is found worldwide, wherever the algae are found. It has been linked to human ailments including Parkinson’s and ALS (Lou Gehrig’s disease). It has also been found in the hair and brain tissue of Canadian Alzheimer’s patients. There are several troubling pathways humans could be exposed to this toxin. These include consuming the milk or meat of livestock or waterfowl who’ve drunk tainted water in dugouts or wetlands, or even bathing in it! Of the three locations studied, the highest levels were found at Patricia Beach, a popular spot for bathers. As bad as they sound, BMAA toxins are not the end of the story, as Dr. Pip explains. 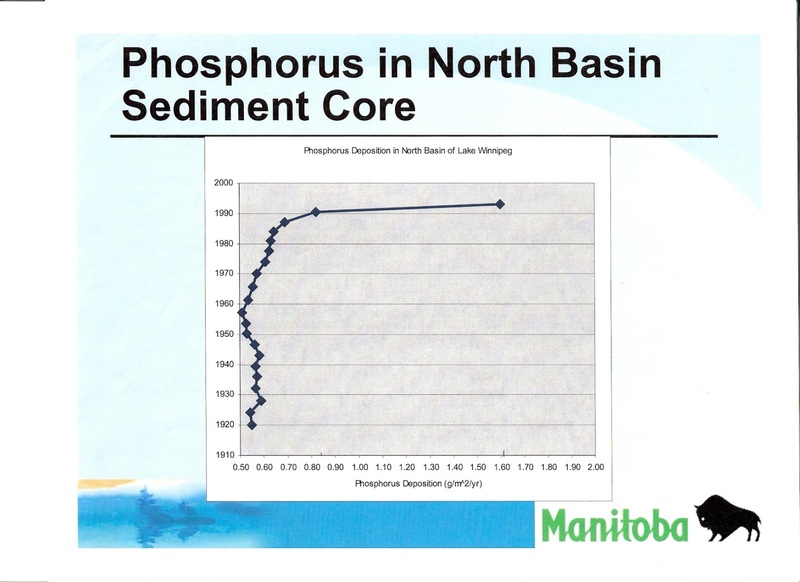 “We found other more important algal toxins in Lake Winnipeg (microcystins, anatoxins) that are much more immediate and potent, and these should be mentioned. We found that microcystins were related to phosphorus and nitrogen in the water. They can be inhaled, absorbed through skin, or ingested. And, then four years ago, Dr. Pip proved that, yes, indeed, it could be! 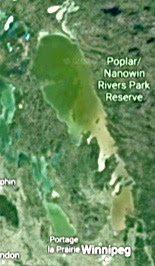 She found a dangerous neurotoxin called BMAA at three places near the shore of Lake Winnipeg’s south basin. Levels of it were found to increase significantly after heavy “blooms” of the blue-green algae and when solids were suspended in the water. BMAA is found worldwide, wherever the algae are found. It has been linked to human ailments including Parkinson’s and ALS (Lou Gehrig’s disease). It has also been found in the hair and brain tissue of Canadian Alzheimer’s patients. There are several troubling pathways humans could be exposed to this toxin. These include consuming the milk or meat of livestock or waterfowl who’ve been exposed to tainted water in dugouts or wetlands, or even from bathing in it. Of the three locations studied, the highest levels were found at Patricia Beach, a popular spot for bathers. They can be lethal to animals, and make people sick. 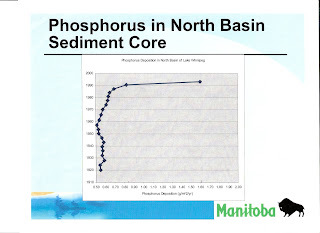 Many communities as well as cottagers draw their drinking water from the lake.” Coliform bacteria (such as E coli) were also associated with phosphorus levels. Despite all this, Premier Brian Pallister, like the industry, seems more than willing to simply write off all those years of collective scientific wisdom. When announcing last spring his government would relax important environmental regulations so thousands more hogs could be produced in Manitoba, he told reporters,“There’s no compelling evidence that any of these changes will put water at risk." Quite apart from the role big hog operations play in harming the quality of our water, is the question of the volumes needed to water the livestock and clean the barns. The amounts are staggering. Figures on volumes already being consumed are hard to come by. But we are already getting a taste of what an expanded industry will look like. Applications are now pouring in for new barns and permission to expanded existing ones. The big pork processing company, HyLife alone, has applied to build no less than 16 big barns, housing some 50,000 hogs in the RM of Killarney, in the southwest. The company estimates all those barns, together, will require something like 48,000,000 imperial gallons per year! (218,212,320 litres!) The hogs will produce well over 31 million gallons of slurry, to be stored in several new earthen lagoons the company proposes to dig. The water will come from new wells. The barns are to be located in the Pembina River watershed and built on land which is currently in crop production. And almost everywhere, animal agriculture plays a role. As the Dutch-based “Water Footprint Network”puts it, “Animal products generally have a larger water footprint than crop products.” While cattle require the most water of all livestock, pigs still need almost six thousand (5,988) litres to produce a single kilogram of pork! But are the threats being posed by the Pallister government's crusade to expand the hog industry, confined to our waterways only? What about the stench produced by massive quantities of hog manure? The industry claims, expansion will do little to worsen that problem. But hog barn odours can be more than just a nuisance. The Handbook warns that gases including ammonia, hydrogen sulphide and methane can not only irritate the eyes and upper respiratory tract, they can, in high enough concentrations, be lethal. “Half of all cases of severe manure gas poisoning are fatal,” it states. “And a few farm workers in Canada die from such poisoning each year,” usually while cleaning out confined spaces such as manure gutters below the barns. Hard figures are not available. But it's believed, in Manitoba, more slurry is now injected directly into the ground, rather than being spread above-ground, as is being done here on farmland near Lake Erie, US in 2014. There is, however, anecdotal evidence that modern technology may be offering some relief. That technology allows farmers to inject the slurry into the soil when fertilizing their fields, rather than spraying it on from above. In the words of one informed source, Eric Rempel, "The anecdotal evidence is overwhelming. It's quite possible to drive past a field where manure is being injected, and not be aware of it. Of course there is some odour, but with skillful operators, it is much reduced. On the other hand, where the liquid manure is being sprayed, the odour is powerful." While he believes that injection is now the dominant method of application, there are reasons it cannot be used everywhere. Many barns are located on marginal land, usually reserved for pasture or hay crops. In those cases, spraying is preferred because injection would "negatively affect" those fields. And injection does not work when the ground is muddy, either. He believes the large, industrial farms actually do a better job of managing their waste than either smaller farmers or Hutterites, who operate large barns on several of their colonies in the province. And, Rempel adds, the push to continue spreading slurry onto farmland in winter, widely viewed as a harmful environmental practise, comes, not from the industrial farms, but small farmers. He once owned a Manitoba company which helped industrial pig farms manage their manure applications. Meanwhile, claims by the Manitoba industry that it doesn't contribute much to climate change, either, do not seem to match evidence elsewhere. While the industrial livestock industry in the U.S. is much larger than ours, it's style of production (confining large numbers of animals in big buildings), is pretty much the same. Recent research by the Institute for Agricultural Trade Policy (IATP) of Minnesota, finds that the biggest American meat and dairy operators, together, emit more greenhouse gases than any of the oil giants - Exxon, Shell or BP - do individually! Living with an “industry-friendly” media. Since his flat statement came with a distinct odour attached, I decided to check it out. So I e-mailed Ming Z. Fan, Ph.D. 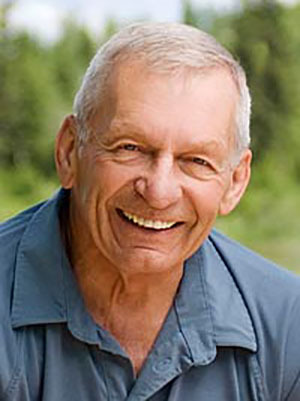 He is a professor of nutritional ecology at the Ontario Agricultural College at the University of Guelph. Here’s how Dr. Ming explains it. It takes a piglet about 5 or 6 months to grow from 2-3kg to a market-sized hog of about 110kg. (Roughly speaking, it would take a human - depending on the individual - about 20 years to reach full maturity!) So, in Dr. Ming’s words, “Simply because model lean pigs grow much faster and eat much more, they will produce much more manure than humans under a given period of time." Waddell’s statement also ignores the fact that pigs now probably outnumber people in Manitoba, by more than six to one! A study prepared for the University of Manitoba shows that, about eight million hogs were being raised in the province in 2015! Yet Manitoba’s human population that year was only about 1.3 million. And, according to Stats Canada, in the five years leading up to 2017, Manitoba experienced “the largest absolute increase in pigs” in the entire country. 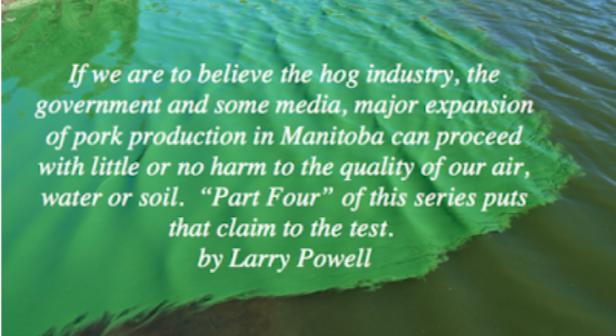 So just how many more pigs and how much more manure will there be right here in Manitoba, once the government’s ambitious (some say reckless) plan to increase production, comes to pass? And is the American experience really one we want to emulate? Surely all of this begs the question; just how big is big enough for the fragile eco-systems of any one province to bear? One of many hog industry critics has already coined a colourful phrase to describe his province. "Manitoba - the manure pile of western civilization!" Might this be an exaggeration, or a looming reality?